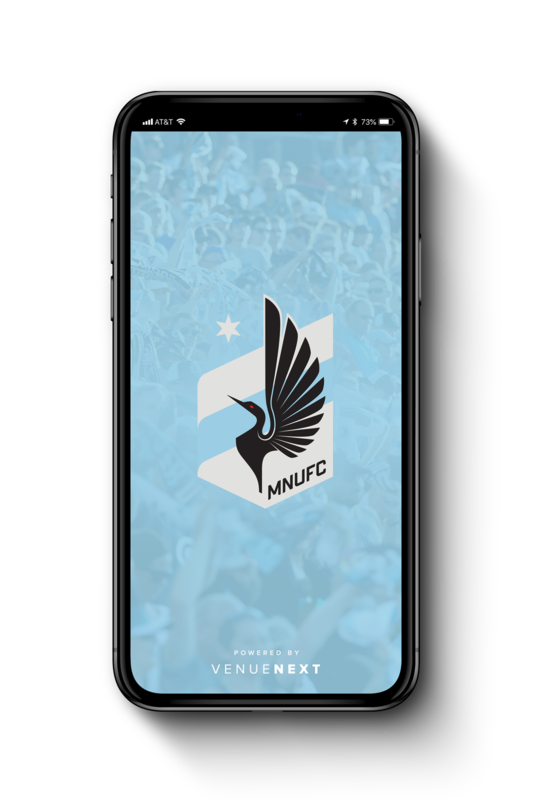 The Minnesota United football club has chosen stadium- and team-app provider VenueNext to build a new app for next season, when the MLS team moves into its new home, Allianz Field. According to an announcement from the team, the app will also include SeatGeek’s ticketing technology, the first time VenueNext has directly integrated SeatGeek into one of its team apps. 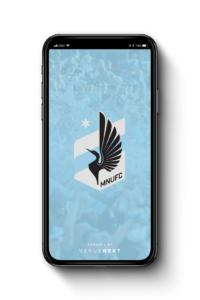 So far we don’t have any looks at the functionality of the app, which is slated to be ready for the 2019 season. The deal is VenueNext’s second MLS win, following an agreement to provide an app for D.C. United and its new home, Audi Field. It also represents another Twin Cities win for VenueNext, which is also the app developer for the NFL’s Minnesota Vikings as well as the NBA’s Minnesota Timberwolves and the WNBA’s Lynx. 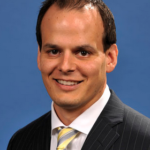 Anthony Perez, former chief marketing officer for the Orlando Magic, has been named the new CEO of stadium- and team-application developer VenueNext, replacing founding CEO John Paul. 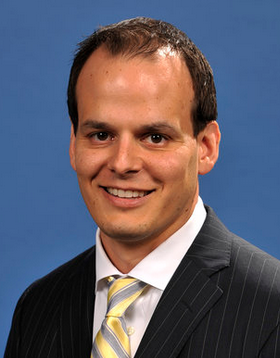 According to a VenueNext press release, Perez had been with the Magic for the past 10 years in “various leadership roles,” including executive vice president for strategy and CMO, a title he gained in 2017. According to the release, Perez helped develop the Magic’s virtual currency strategy which has been one of the big successes for VenueNext as its app powers the program. The Magic were VenueNext’s first NBA customer and the second customer overall after the San Francisco 49ers. 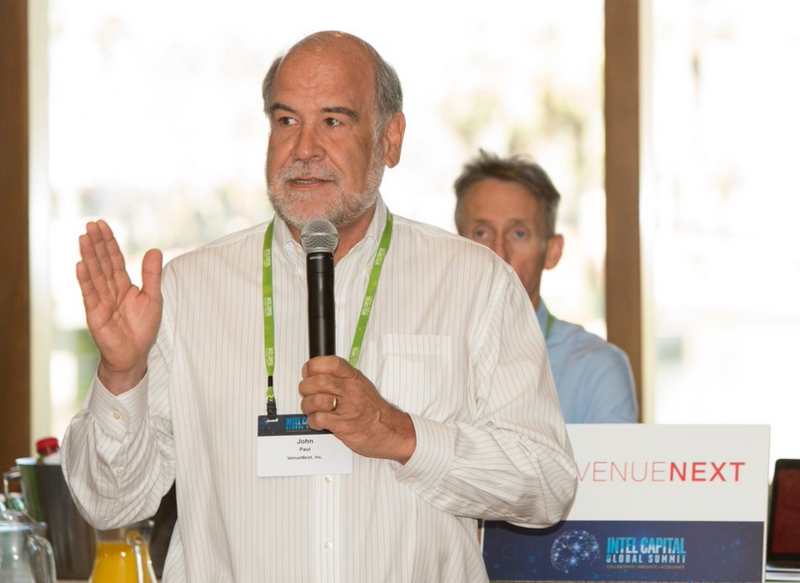 Former CEO Paul will remain as vice chairman on VenueNext’s board, and according to the release will assist the company on future moves like a planned expansion into European markets. A longtime computer industry veteran, Paul led VenueNext’s charge into the app market for stadiums and arenas with a strategy based more on enabling services like ticketing, loyalty programs and mobile concession ordering and delivery, with the Niners’ new Levi’s Stadium as its proof of concept platform in 2014. With $24 million in venture funding as of 2016, VenueNext appears to be in good shape, even if it is still a ways away from reaching its publicly claimed target of 30 customers that Paul said it would have three years ago. While the company’s website does not have a full list of customers, VenueNext has said in the past that it does have clients signed already in the healthcare and hospitality markets, but cannot name them due to confidentiality agreements. 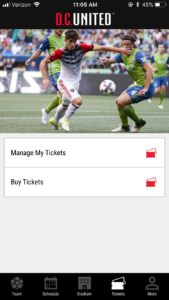 As D.C. United gets set to move into Audi Field, the team announced it has chosen VenueNext to supply a new stadium and team app, which will include support for a wide range of services including digital ticketing, video highlights and replays, and a virtual currency that will let fans purchase goods and services at the stadium via their mobile device. The new deal is VenueNext’s first customer in Major League Soccer, following earlier wins with pro teams in the NFL and Major League Baseball, as well as the NHL and NBA. One of the MLS’ founding clubs, D.C. United will move into the new 20,000-seat Audi Field in the middle of July. 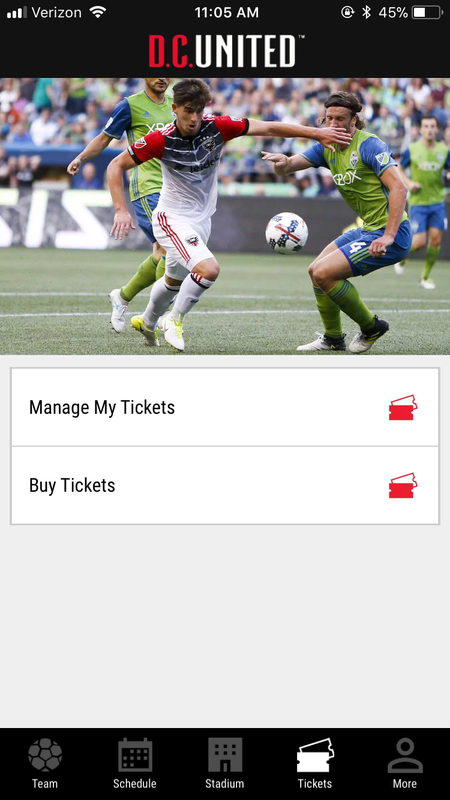 According to a press release from VenueNext, in addition to video and static content about the team, players and league, the app will also support mobile ticketing for stadium entry, the ability to order concessions via the app for express pick-up, in-stadium and public transit wayfinding, and directions to parking. Intel True View coming to Niners, Vikings apps; but will anyone watch? 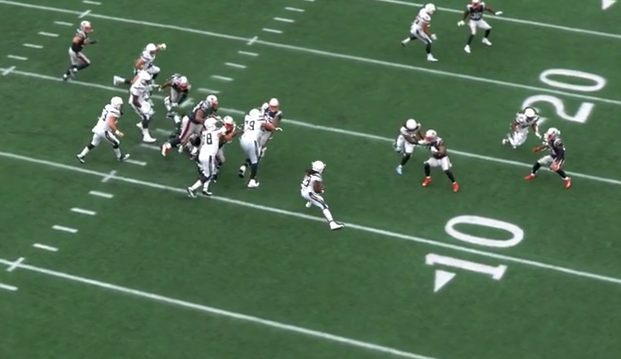 Screen shot of an Intel-powered 3D view of an NFL game. From a sports viewing standpoint, there may not be a more compelling new technology lately than Intel’s True View platform, which can provide 360-degree 5K-resolution looks at a sporting event that are equally stunning and informative, a true leap in performance for TV-watching fans. Last week, a move by Intel to provide venture funding for app development firm VenueNext seemed like a great deal for fans of the NFL’s San Francisco 49ers and the Minnesota Vikings, whose stadium apps are slated to get the Intel technology to support 3D replay views, perhaps as early as next season. While both the funding and the replay plans are positive moves for sports fans, our question is, will anyone really watch? 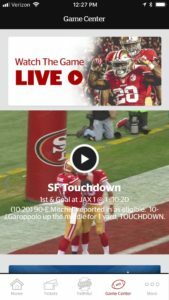 While VenueNext’s app platform seems to be gaining momentum with pro teams from all the major U.S. sports leagues, the instant replay function — which was part of VenueNext’s first platform, the app for the Niners’ Levi’s Stadium — has never really caught on, peaking at the start and slowly dwindling thereafter. Replays on other mobile platforms, however — like Twitter — are enormously popular, with one Vikings video alone earning more than 4 million views. 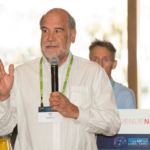 VenueNext CEO John Paul at last week’s Intel event. Though the Intel/VenueNext announcement garnered a lot of headlines last week, none of the other stories mentioned how little-used the instant replay function is. In fact, almost every team or stadium that has instant-replay functionality in its app declines to provide any statistics for the feature, a shyness we can only attribute to the fact that the numbers are embarrassingly low. 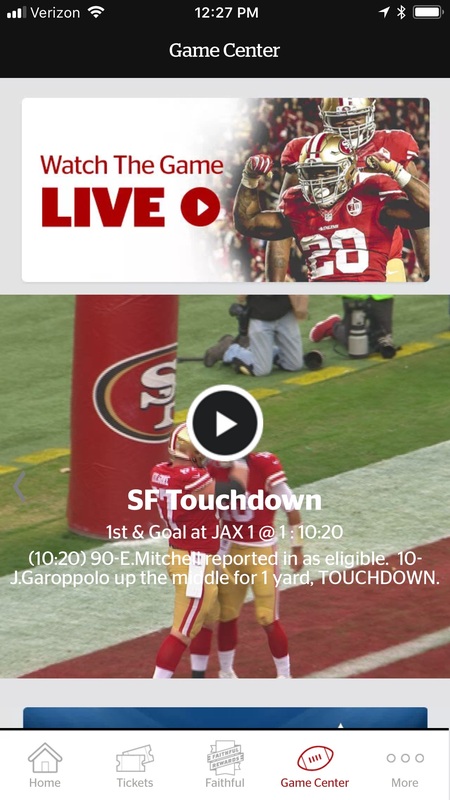 The only one VenueNext was able to tell us about was the Niners’ app, which according to VenueNext generated approximately 1,000 views per game last season. One reason York cited for the low replay use was the quality and frequency of replays shown on the Levi’s Stadium large video boards; while in the past many pro teams kept replays to a minimum (especially if they were unflattering to the home team) the acceptance of replay review in many leagues and a general change of behavior now sees almost constant replay showing, as well as live action on in-stadium video boards. And while the process to produce in-app video replays is stunningly quick, even the fastest replay functionality combined with the need to navigate a device screen is usually well behind live play. Screen shot of instant replay service inside Levi’s Stadium app. Since the amount of funding Intel is providing VenueNext was not announced, it’s hard to tell whether or not either company will consider the transaction worthwhile if the replay viewing numbers remain low. Another problem with the app replays is that many are confined to in-stadium views only due to broadcast rights restrictions; compare that handcuff to the openness of Twitter, where a video of the “Minnesota Miracle” walkoff TD shot by a quick-thinking Minnesota Vikings employee (Scott Kegley, the team’s executive director of digital media & innovation) during last year’s playoffs garnered more than 4 million views and recently won a Webby award. If there’s a dirty not-so-secret about stadium wireless connectivity, it’s that almost every report we’ve ever seen about app and service usage inside venues puts use of open social media platforms like Twitter, Snapchat and Facebook far, far above team and stadium app usage. Though stadium and team apps are gaining more traction recently due to their embrace of service functionality for things like parking, concession transactions and digital ticketing, we still haven’t seen any reports or evidence that in-stadium instant replays are gaining in use. Will Intel’s revolutionary technology change the game for in-app replays? We’ll track the developments and keep asking for stats, so stay tuned. 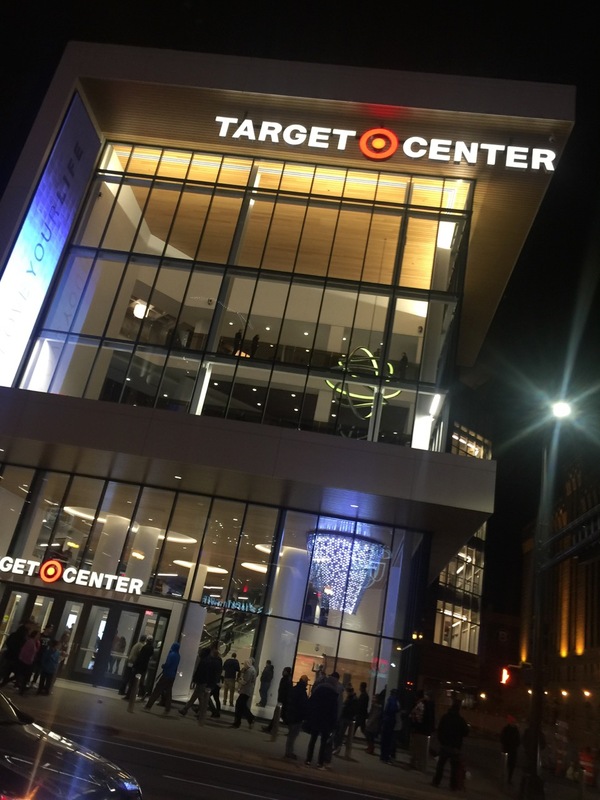 For Minneapolis residents who passed by every day, the renovation of the Target Center might have seemed like a mining project, chipping away at a somewhat blank slate until a sparkling gem was revealed. 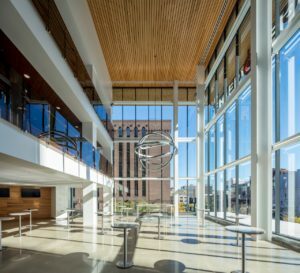 Now complete, the 2-year, $145 million project to update the 28-year-old downtown venue has brought the 19,356-seat arena to the forefront of advanced fan experiences, with its main tenants, the NBA’s Minnesota Timberwolves and the WNBA’s Lynx, now able to offer fans amenities like open club spaces, high-density Wi-Fi and cellular connectivity, and a new mobile app as well as a huge new center-hung video scoreboard. All those features are located inside the arena’s shiny new exterior, which includes a multi-level atrium with glass windows facing the streets, replacing the old concrete walls. According to Ted Johnson, chief strategy officer for the Timberwolves, the renovation “touched every surface,” with new seats, bathrooms and other hard-to-notice items like a real loading dock to make it easier to move equipment (like concert staging) in and out of the arena. Editor’s note: This profile is an excerpt from our latest STADIUM TECH REPORT issue for Spring 2018, which includes a look at Wi-Fi performance during the Final Four, a recap of wireless performance at Super Bowl 52, a profile of new venue construction in Los Angeles and more! DOWNLOAD YOUR FREE COPY right now from our site! On top of the physical changes came the technology layer, with obvious improvements including the center scoreboard, which Johnson said is “the largest in the Midwest,” and four new large video boards in each of the stadium’s upper corners. New LED ribbon boards circle the stadium bowl as well, with one lower one and another series of ribbons above higher entryways that create what Johnson calls an “optical illusion” of a second continuous ribbon. A new fiber-based network backbone was also installed, to support a cellular DAS deployment as well as a new Wi-Fi network designed and deployed by AmpThink, a company extending its mark in Minneapolis after previous Wi-Fi deployments at U.S. Bank Stadium and the Mall of America. 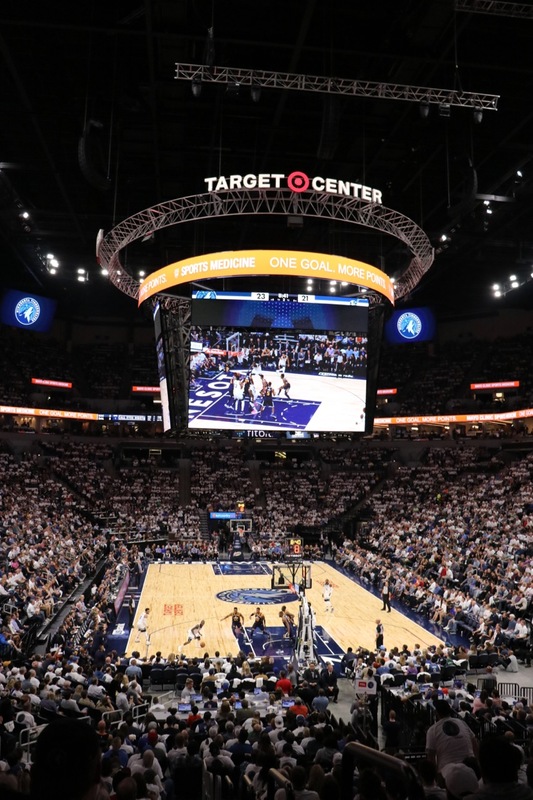 According to AmpThink, the Wi-Fi network inside the Target Center has approximately 400 access points, but since many of those are the newer Cisco 3800 versions with two radios in each AP, there are actually about 550 radios serving the stadium. 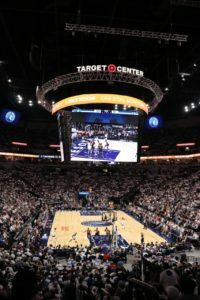 During a visit to the arena during a game in November, Mobile Sports Report found solid Wi-Fi speed results in all parts of the venue, including the upper seating areas and the concourses. Walking around the upper concourse by section 240 we got a Wi-Fi speed test of 34.42 Mbps on the download side and 45.20 on the upload; in the same location, a test of the DAS network for a Verizon Wireless client saw speeds of 22.88 Mbps / 22.66 Mbps. Moving into the upper stands, at the top rows of section 239 we still got Wi-Fi speeds of 33.73 Mbps / 61.56 Mbps; looking up, we could see multiple Gillaroo antennas mounted up in the catwalks, along with the glowing blue lights of the APs. Down in the open gathering area near the brewpub (located in the stands behind one of the baskets) we got Wi-Fi marks of 21.26 Mbps / 67.07 Mbps. Then in one of the stadium’s club suites we got a test of 42.27 Mbps / 68.83 Mbps, with all tests taken during game-action times. We did not get any lower-bowl seating area tests, where AmpThink said it has deployed APs under seats. 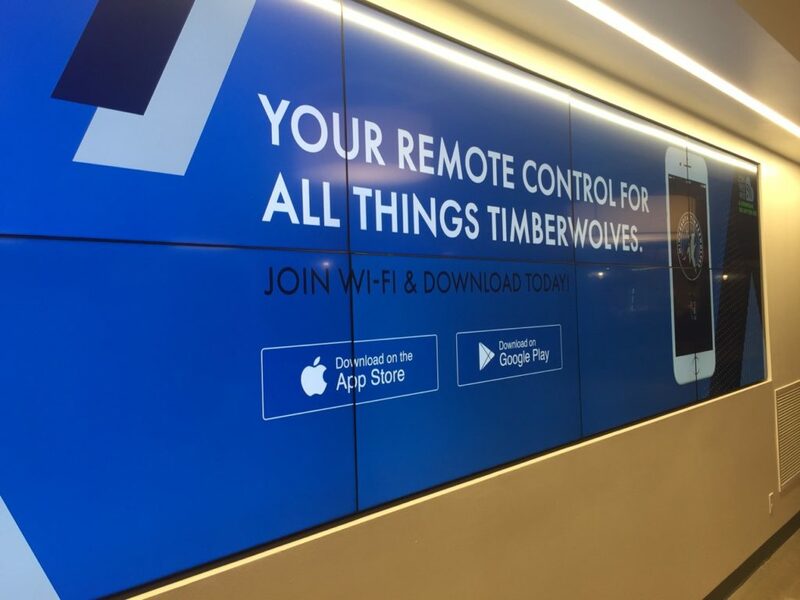 In addition to its Wi-Fi design and deployment, AmpThink is also assisting the Timberwolves in using the digital displays to drive fan engagement with the app and the Wi-Fi network. The AmpThink tests, Johnson said, along with the decision to switch to VenueNext for a new app (which supports more fan services than the previous, content-focused team app), are part of a deliberate strategy to build a next-generation “seamless fan experience” that starts long before fans get to the arena. 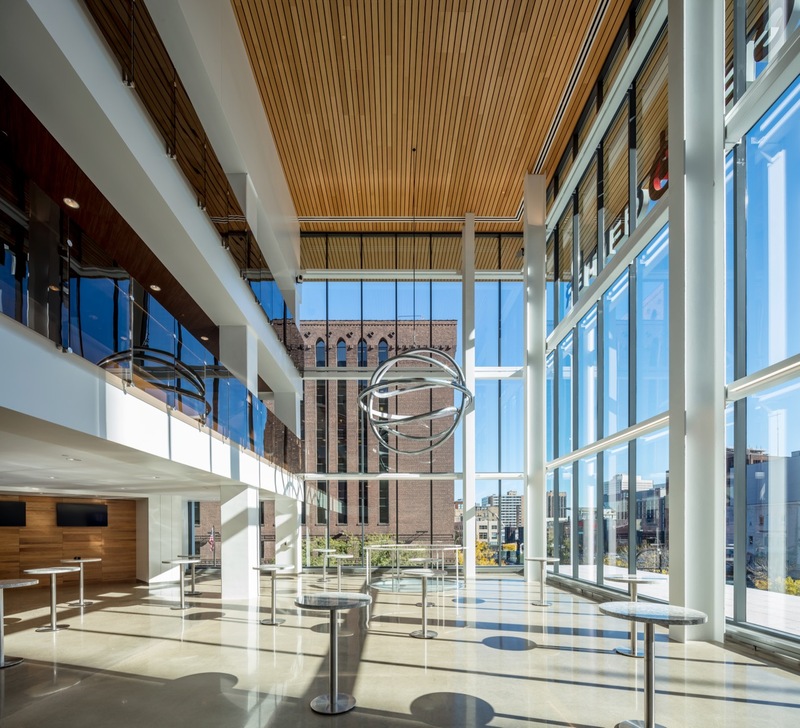 A big part of the physical renovation, Johnson said, included improvements to the intersections between the arena and downtown Minneapolis’ famed Skyway, the connected maze of in-building public walkways and skybridges that links much of downtown together. “Right now 12,000 to 15,000 people a day come through our building via the Skyways, and about 66 percent of our fans come into the building through there [the Skyway],” Johnson said. 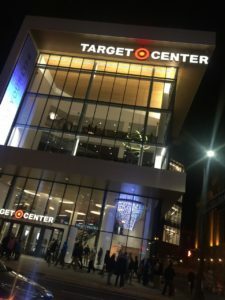 As part of the renovation the Target Center added digital displays to its Skyway territory, and the team is part of a city-wide plan to bring beacon technology to the Skyway system so that a wayfinding app could be used to help visitors, residents and anyone else better find their way around. The San Antonio Spurs announced a new version of the team’s mobile app, which includes new features both for fans attending Spurs home games at AT&T Center as well as for fans following the team remotely. The new features were added to the app by developer YinzCam, which also designed previous versions of the team’s app. According to YinzCam and the Spurs, a new interface designed for clarity and faster navigation will help fans find new features like blue-dot wayfinding (available only for Apple iOS devices) as well as new interactive maps available for both iOS and Android devices. Another update is the inclusion of on-demand replays for fans at AT&T Center, with four different camera angles to choose from, according to YinzCam. In a nod toward a trend of team and stadium apps adding more attendance-specific services, the new version of the Spurs app will inlcude a “Season Ticket Member Club,” which the Spurs and YinzCam said will provide special offers and discounts, as well as the ability for season ticket holders to have single sign-on access to Ticketmaster’s account manager, which they can then use to digitally manage their tickets. What’s not clear is if this update is an addition to an update YinzCam was scheduled to provide to the Spurs in the wake of a 2015 deal with the NBA under which YinzCam was to redesign 22 NBA team apps, including the Spurs’. Since that deal several teams have replaced YinzCam with a competitor — the Minnesota Timberwolves, the Utah Jazz and the Charlotte Hornets are all currently working with VenueNext to deliver their team apps. The Orlando Magic are also a VenueNext client, the first NBA team to pick that developer. YinzCam, however, still claims to have developed 21 of the NBA team apps in use this season, including apps for the following teams: Atlanta Hawks, Brooklyn Nets, Boston Celtics, Chicago Bulls, Cleveland Cavaliers, Denver Nuggets, Golden State Warriors, Houston Rockets, Indiana Pacers, LA Clippers, LA Lakers, Memphis Grizzlies, Milwaukee Bucks, New Orleans Pelicans, New York Knicks, Oklahoma City Thunder, Philadelphia 76ers, Phoenix Suns, Toronto Raptors and the Washington Wizards. The Sacramento Kings and the Miami Heat use apps designed by Built.io, another newcomer in the stadium and team-app market. This year the Detroit Pistons turned to Venuetize for their team app in their new home, Little Caesars Arena. According to this release Venuetize also helped design the new app for the Portland Trailblazers. The Dallas Mavericks’ team app is supplied by Tixsee.